A medium curry ideal for meat, chicken, fish or vegetables! 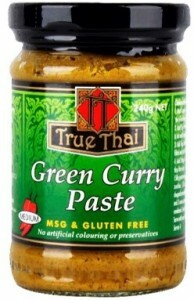 Love making green chicken curry with the True Thai Green Curry Paste it tastes great. I wish the recipes were on line as it is a bit hard to read the back of the jar as the writing is so small and in white rather than black.Gave it four stars but only lost one due to not being able to read recipe otherwise would have been five. Hi Ann, we are pleased to hear you love making Green Chicken Curry with our True Thai Green Curry Paste! We have taken your concern regarding the recipes being hard to read on board and are looking into adding some delicious recipes to our website in the near future. Thank-you for your feedback & keep your eye out for the recipes. Hi Julian, thank-you for voicing your concerns in regards to the labelling. This issue will be discussed with management and resolved as soon as possible. Once we get our new recipe page up and running, the full recipe will be available for you to view online. This curry paste is delicious and so versatile. Made a chicken & vegetable stir-fry and added a scoop of the paste for extra flavour. Also followed the recipe on the packaging, just added more vegetables and the curry turned out fragrant.